By Katie Renouf, Web Writer. Steam reforming, where hydrogen gas is produced from hydrocarbon fuels such as natural gas, is an important industrial catalytic process. Nickel is the catalyst of choice due to its low cost and high C-C bond rupture activity, and zirconia (ZrO2) is widely used as the catalytic support due to its thermal and chemical stability, moderate acidity and surface oxygen mobility. The same supported Ni/ZrO2 catalyst is a promising candidate for ethanol steam reforming (ESR), but its deactivation caused by sintering and coke deposition remains a problem. Jinlong Gong and researchers from Tianjin University used a surfactant-assisted method to prepare a nanocomposite Ni@ZrO2 catalyst made up of nickel nanoparticles distributed evenly throughout a similarly sized zirconia matrix. The new catalyst demonstrated higher activity and selectivity for the conversion of ethanol into CO2 and H2. Almost complete conversion of ethanol over a 50 hour period was observed, while the activity of the traditional Ni/ZrO2 catalyst decreased continually after just six hours. 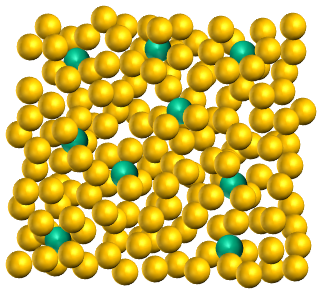 The even distribution of metal nanoparticles throughout the matrix allows the pore structure of the solid to be maintained while increasing the accessibility of the catalytically active nickel. The larger metal-oxide interface promotes the removal of carbon deposits while the “confinement effect” prevents the nickel metal from sintering. As highlighted in a recent C&EN article, these promising catalytic properties suggest that the synthetic methodology may be useful for the design of metal catalysts for other processes, such as dehydrogenation, that encounter similar problems.